This is a guest post by traditional foods expert and renowned chef Monica Corrado. 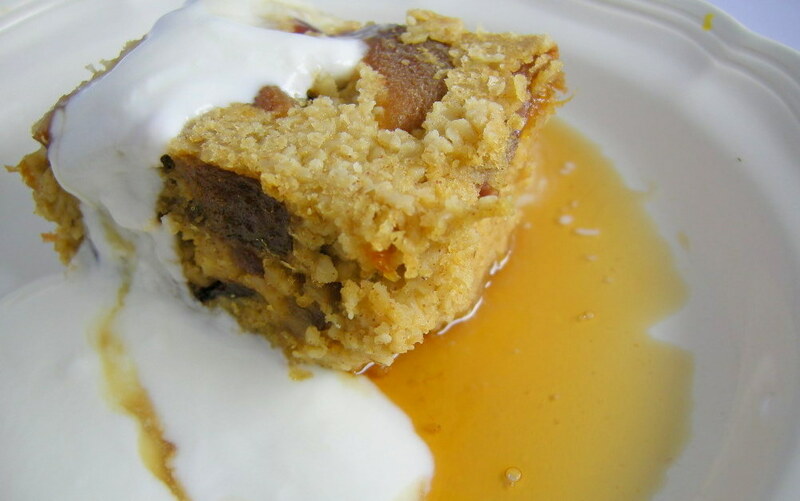 Baked oatmeal, a nourishing alternative to breakfast cereals. One more time I am going to make the argument/request/plea to serve your children (and yourself) a hot breakfast. No more cold cereal, even organic. “Why?” you ask. The first reason is that boxed cereal is not a food; it is a food product. Don’t be fooled by the words “organic” across the top, boxed organic cereal is not food either. Don’t be fooled by the words “whole grain.” There isn’t a whole grain to be found in boxed cereals. All made into a slurry, all passed through an extruder at high heat and high temperature. (More information about the cereal extrusion process HERE and HERE.) I can’t find anything that looks like a “whole grain” in those boxes. Can you? Is it a wonder that our children have food allergies, blood sugar swings, mood swings, eczema, constipation, diarrhea, gluten intolerance, leaky guts? Okay, more reasons. Nearly all the cereals have sugar listed as their second or third ingredient. Organic or not, SUGAR is NOT something your child needs. The grains in boxed cereal have not been properly prepared, so they are full of phytic acid and enzyme inhibitors. Phytic acid blocks the absorption of minerals in the small intestine, (minerals all bodies need) and enzyme inhibitors inhibit enzymes which we all need to digest our food. But worst of all, the delicate proteins in grains are damaged by the processing they have to go through in order to become boxed cereals. And damaged proteins equal toxins. And since organic grains are higher in protein than conventional grains, organic cereals are highly toxic. They are so toxic that it would almost be better for you to serve your children “conventional” boxed cereals, full of dyes and high fructose corn syrup, according to Sally Fallon Morell of the Weston A. Price Foundation. You know, like Fruity Pebbles or such. Can you believe it? So … if you are going to serve your child grains at all (and I strongly suggest that you refrain from serving grains until after all four back molars are in—could be 18 months to 2 years of age) that you serve them SOAKED grains. Start with soaked oats, and be sure to serve them with plenty of healthy fats (butter from grass-fed cows (see sources), coconut butter (see sources) or coconut milk, raw cream or milk, ghee or coconut ghee). I like to add raisins while the oats are cooking to add a little sweetness. Just about a handful per cup of oats. When you are ready to cook the oats, bring an additional cup of water to the boil. Toss the entire oat mixture into the boiling water, and turn the temperature to low. Stir. Add a handful or more of raisins or crispy nuts at this time, as well as a pinch or two of high quality sea salt (one with lots of trace minerals, 50+). Cook 3-5 minutes, or until oats reach desired consistency. Note: make a double batch (just multiply the quantities by two) and cook the whole thing. Store leftovers in the refrigerator. They can store up to a week or 10 days in an airtight container. (They will just become easier to digest over time.) 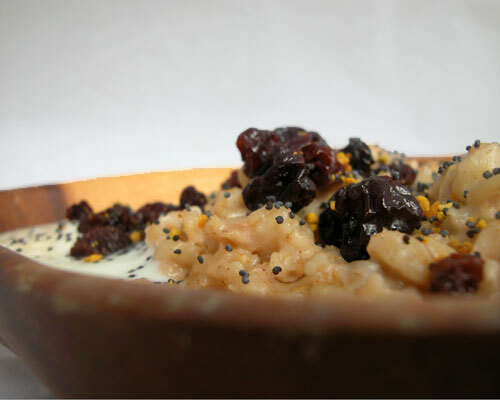 You may easily reconstitute the oats by putting them in a pot and adding boiling water and stirring, heating through. You may also use them to make “oatcakes”, a favorite in my house. The recipe follows. Beat egg and mix with leftover oatmeal in a medium bowl, until you have a nice batter. Bring cast iron skillet or griddle to medium heat and coat with pastured butter or coconut oil, bacon fat or lard. Spoon into pan by tablespoons. Fry like pancakes. Wait until you see bubbles on the top to flip. Cook about 2-3 minutes each side. These make great snacks! Store them in the refrigerator or dry them on a sheet pan in your oven for crispy oatcakes! Serve with yogurt cheese, butter, fermented apple butter, nut butter or coconut butter. Delish! Enjoy!